Welcome to Found Off The Street, our look at cars found on the cape that rust liked so much it decided to summer there; Cape Cod, MA. 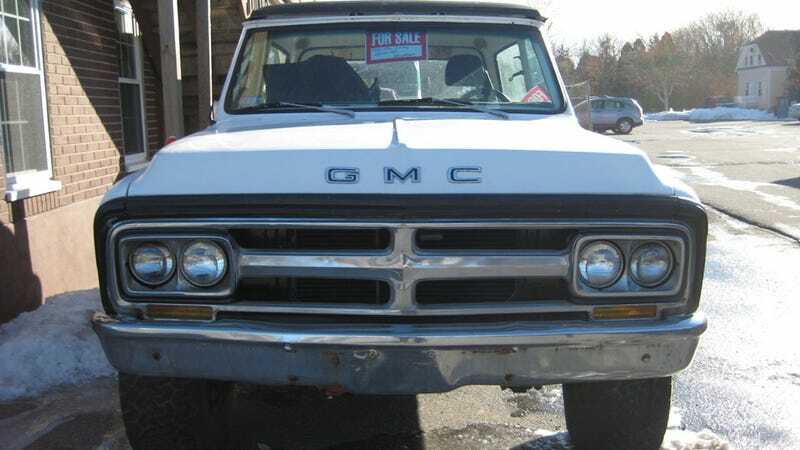 Today we have a 1970 GMC Jimmy. Last week's FOTS 1954 Willys CJ-3B spent its days in the elements and its nights and weekends inside. This week's 1970 GMC Jimmy has spent this winter and likely many others out in the elements. A closer look reveals the battle scars and rust that comes with plenty of time spent outdoors in the winter weather. 1970 was the first year for the Jimmy, GMC's version of Chevrolet's K5 Blazer. The Jimmy and the Blazer were the smallest full size trucks that GM produced at the time. Both short wheelbase models were well known and liked for their fully removable convertible hard tops. The very cool fully convertible tops would only last until 1975 when they were replaced by a safer half cab convertible design. The half cab convertible was available on full size Jimmys and Blazers until 1992. The Blazer was first introduced in 1969 a year before the Jimmy as a more "luxury" alternative to the Ford Bronco and International Scout. Although compared to the trucks of today it's hard to believe these SUVs where ever considered a luxury vehicle. All it took was a few options like A/C and an Automatic transmission to upstage the no frills offerings from Ford and IH. By 1970, the Blazer had already outsold the Scout and the Bronco. Also available in a rear wheel drive model, this week's FOTS Jimmy left the factory with the 4 wheel drive option checked. Underneath the hood is a small block V8 with a manual transmission behind it. Although when it left the factory it was a posh alternative to the bare bones SUV, at some point in its life the interior of this particular Jimmy was almost entirely removed. By my own admission, even without most of the interior, it is still looks comparable comfort wise to my beloved old Scout. The body of this old Jimmy tells the tale of some time spent in the snow and the salt you hear so much about in FOTS. While there is no visible rust on the outside of the vehicle, several signs including the rust underneath the truck lead us to believe the Jimmy has been the recipient of some significant rust repair at some point in its life. Like the Scout and the Bronco, early Blazers and Jimmys are very rust prone vehicles. Combined with the fact most were used and abused, like many early SUVs their survival rate is somewhat small. This Jimmy first came up for sale last fall and grabbed my interest because old full size Blazers are a rare sight on the cape that rust remembered. If that wasn't enough, an old ratty but rust free full convertible Jimmy/Blazer holds a spot on my automotive bucket list (I'm not positive they can still be found). Even though the condition of the body and the $4500 price tag mean this truck isn't the one that will get Blazer ownership out of my system, every time I drive by it the concept does cross my mind. Until someone comes along willing to do more than passively entertain the concept of ownership, the old truck will likely remain where it is. I could be wrong, but I have a sneaking suspicion even once this old Jimmy finds a new owner, it still won't have seen the last of winter weather in Massachusetts.